KLH Center Speaker - Nice! KLH Center Speaker - Nice!. Condition is Used. Shipped with USPS Priority Mail. 4 out of 5 stars - KLH Center Speaker - Nice! 1 product rating1 product ratings - KLH Center Speaker - Nice! KLH SURROUND SOUND 8S & 10C SPEAKER LOT SET OF 5 SPEAKERS TWISTABLE free ship! This is a KLH 5 Speaker Surround Sound Set. It includes a 10C Center and (4) 8S Speakers. All are 8 ohms and shielded for video. They have been tested and work great. For indoor/ outdoor use. KLH Amplified Subwoofer Model S6100 Powered 100 Watts. Model: S6100. Amplified Power: 100 Watts. 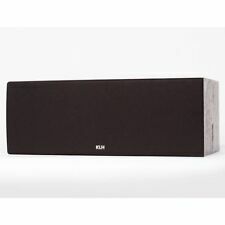 KLH Stereo Speakers (Black) 11.75" x 8" x 4.5"
KLH Stereo Speakers (Black) 11.75" x 8" x 4.5". Condition is Used. Shipped with USPS Priority Mail. 4.5 out of 5 stars - KLH Stereo Speakers (Black) 11.75" x 8" x 4.5"
7 product ratings7 product ratings - KLH Stereo Speakers (Black) 11.75" x 8" x 4.5"
This KLH Soundbite V powered subwoofer is in condition of perfect performance and attractive appearance. The grill is in perfect shape and any slight nicks to the edges or corners have been retouched with a flat black paint pen. KLH (Linear Dynamics) Model 403 Speakers - Nice! Very Nice Linear Dynamics by KLH speakers. Model 403. Both work. Any discrepancies are not intentional. KLH 9930 Satellite speakers . Condition is Used. Shipped with USPS Priority Mail. Two speakers good replacements for a current set. KLH Model: 61 Premier Series Speaker. 1" Tweeter. Only what is pictured/described is included. 6 Ohm Impedence. KLH Model 403 Speakers Linear Dynamics 40 Watts @ 6 Ohms. Condition is Used. Shipped with USPS Priority Mail. 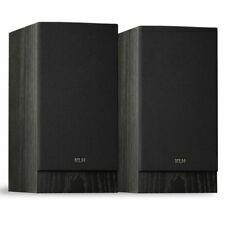 Brand new pair of KLH L853B 3 Way Black Bookshelf Stereo Speakers 125W. In original box, opened to inspect them. Mint condition. KLH Subwoofer Speaker. 3 Local Pickup Locations Gordon LaSalle Music. Southbridge, MA. 339 Main St. Speakers are in good condition. East Hartford, CT 06108. KLH Audio Systems. KLH Titan Series. left / right channel speakers. Speaker System Type. SPEAKER SYSTEM. System Components. Product Line. AUDIO SYSTEM. Excellent Condition & Sound. I am not affiliated with in any way. Speakers are used in VERY GOOD! Tested working. 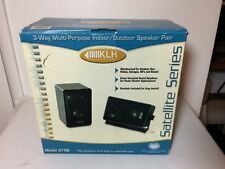 KLH Audio Systems 2-Way Satellite Speakers Model 2503 Up for sell is a KLH Audio Systems 2-Way Satellite Speakers Model 2503.Have a few scuffs & scratches. Tested & Sound Great !! Shipped with UPS Ground. Beacon Surround Speakers - Pair. Product ID #: BEACON. Product Information. 2x 5.25" woven Kevlar bass drivers. World Wide Stereo:Awe Inspired. Since 1979. Weight: 11.25 lbs. THIS IS FOR A KLH #687 CENTER CHANNEL SPEAKER THAT IS IN VERY GOOD WORKING CONDITION. IT HAS TWIN MID/WOOFERS & A TWEETER. SORRY THE GRILLE DOES NOT REMOVE. IT IS APX. 18 1/4" W X 5 3/8" H X 5 1/4" D. APX. Try the "ZOOM" feature, it is a great way to take a closer look. Weight 2 LBs 13.6 Oz. Pair of indoor/outdoor KLM 970A speakers. 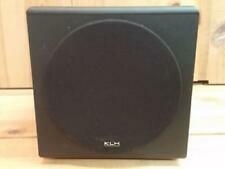 (2) KLH 10" WOOFERS MODEL 6. One of the woofers has a slight tear. In Good Physical Condition. 3 Local Pickup Locations Leominster, MA 01453. Twin City Mall. Gordon LaSalle Music. Southbridge, MA. 339 Main St. East Hartford, CT 06108. Model: SRV880. NEW KLH Audio Systems 8" 2-Way Landscape Outdoor Speaker (a Pair). 8" Polypropylene Woofer with a Coaxially Mounted 1" Polycarbonate Tweeter. Item : 8" 2-Way / 100 Watts Landscape Speaker Pair. 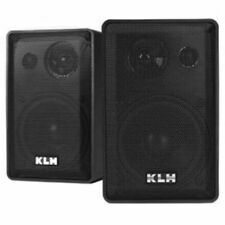 Brand: KLH Audio Systems Item: 8" 2-Way / 100 Watts Landscape Speaker Pair Condition: New in packaging but outer packaging has heavy shelf wear. Please refer to pictures. Description: 8" Polypropylene Woofer with a Coaxially Mounted 1" Polycarbonate Tweeter. Weatherized enclosure for outdoor use. Environmentally compatible to blend with any landscape. Includes 50ft. of underground speaker cable. Perforated, non-removable grille. Suggested amplifier power of 5 to 100 watts per channel. Impedance - 8 Ohms average Earth tone granite finish. Sunset series. AH1 Please see all photos for the best description of the box. Contents inside are brand new. Thanks for looking!! Rare Made in USA KLH AV3001 2-way 140Watt Bookshelf Speakers-Tested/Sweet+Pound! Incredibly Rare - you will not find these for sale almost anywhere - not many of the 3001's were made, owners rarely part with them, and they are one of the best products KLH still made in the 1990's - blows the other 1001 series models away! The KLH SS-02 are a compact ( 7 1/4"H x 5"W x 4 3/4"D ) pair of speakers with excellent sound quality. Very nice like new condition, well cared for. 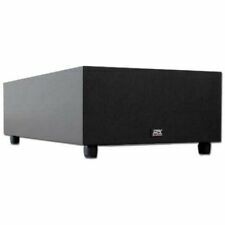 Well suited for a stereo system in a small room; or for added surrounds in a larger system. Pair of Nice Rare KLH B-PRO6 Bookshelf Speakers. KLH Audio Systems. KLH Titan Series. Connectivity Technology. left / right channel speakers. Frequency Response. Product Line. Driver Material. Model 979B, 3 Way. With brackets, wire, mounting pads, and hardware. Indoor or outdoor capability. Unused in original box. 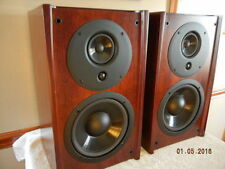 These speakers are used and in great condition. They have been tested and sound great. Physically they are also in good shape with no dings, dents, and only a couple of scratches, ect. They are 4-6 ohm, 40 Watt Speakers. See all photos. WHAT YOU SEE IN THE PICTURES IS EXACTLY WHAT YOU WILL RECEIVE. This is a set of 3 KLH Model 2410 speakers. It has the two little side speakers and the center long speaker. Based on others, I am asking 25.00. Any questions or concerns feel free to contact.